Reddit user Rach11 made these sweet periodic table cupcakes for a safety seminar reception for her fellow chemical engineering graduate students. The vanilla cupcakes are topped with buttercream frosting and adorned with fondant cutouts that show each respective element. 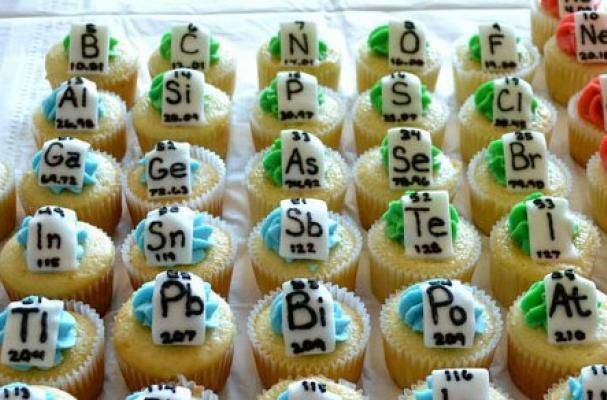 Last month, my colleague Amy Jeanroy wrote about a group of students who recreated the periodic table in cupcakes in honor of their physics professor. Check out their creation here. Attractive­, creative and I'm sure delicious. Time consuming to have to label all of that fondant and then assemble. But the result is stunning.